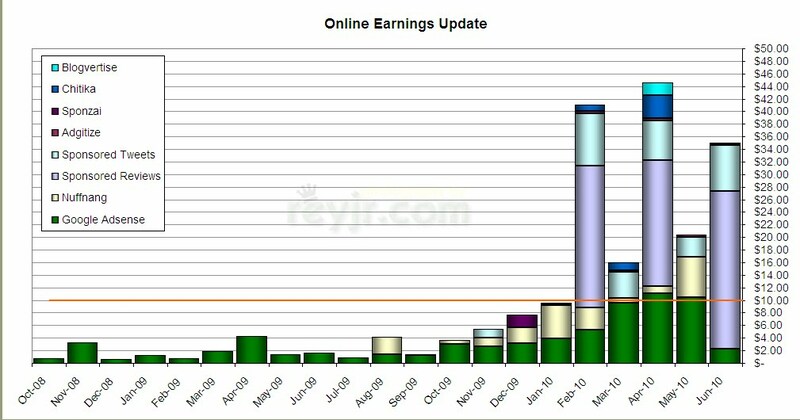 Welcome to the June 2010 edition of my Online Earnings Update. :) It is an interesting month for my online earnings, first because of the dramatic drop of my Google Adsense earnings and what caused it, and second, how much can you actually earn via the new service of Sponsored Tweets. 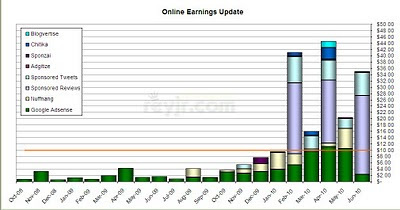 If it is your first time reading this, I've decided to blog about my online earnings monthly on my Twitter account, and my Personal Blog. I am not actively pursuing this earning online business - I'm posting twice a week about things I usually blog about, receiving around 150 unique hits per day, and am only spending at most 1 to 2 hours daily writing and promoting my blog because of my busy work schedule. If you are in the same situation, I invite you to share what you know and how your efforts have been fruitful. If you are a newbie like me, then read on and join me on this journey! Sponsored Reviews - $25.00 -If there was one service I would recommend you to apply for, it would be Sponsored Reviews. You may not be able to earn a consistent amount every month, but actually, if you get the right opportunities, it can earn you money much faster than Google Adsense. In the last 6 months, I've accumulated $67.50 on Sponsored Reviews. Google Adsense - $2.29 - A dramatic drop from the last 3 months when I was averaging at around $10 a month, this month was a surprisingly low $2.29 - what the heck happened?! If it wasn't for my other earning services, I would have missed my $10 target this month. 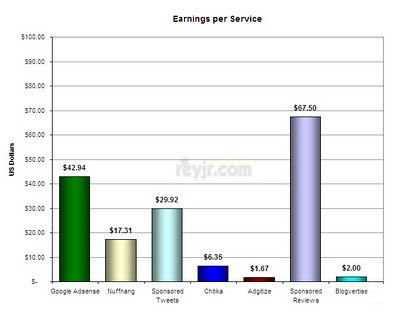 See, i was trending Google Adsense earnings vs. Ad impressions and it shows clearly that my ad impressions were increasing but my earnings have stopped. Gasp! :p I have 1 theory - ad color template. I changed it last month to make it more "visible" and well, it seems it backfired on me. Sponsored Tweets - $7.33 - Broken down to $6 from actual opps, $1.19 from PayPerClick tweets and the rest from referrals. That means around 16% of my month's Sponsored Tweets earnings are from PPC tweets. Is it worth the effort or not? You decide! Chitika - $0.11 - Is it going to rev up soon? Or is it running at all? I have no idea. But the high hopes I had for Chitika are beginning to diminish. I'll give it another month before I decide! Adgitize - $0.28 - So, I've been procrastinating in letting go of this service, and so it still sits there on my sidebar being clutter. :p The 6-month total is now a whopping $1.67 - argh! Should I just give up on this one now? I learned that even though there are numerous services that pay you to post an ad or a review on your blog, you have to remember that putting it on your blog automatically gives it YOUR stamp of approval - no matter what kind of disclaimer you put there. :p So make sure you post only about things you really approve of or are sure about!